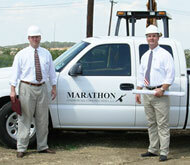 It is the mission of Marathon Commercial Construction, LLC to honor and glorify the Lord in all things. We endeavor to accomplish this mission daily through providing superior client services, producing unparalleled excellence in construction, supporting and fostering the personal and professional advancement of our employees, and growing corporate profitability. In 490 B.C., a heavily-outnumbered force of Greek soldiers under Athenian General Miltiades repelled and defeated an invading Persian army at the Battle of Marathon, permanently altering the balance of power in the region. Following the battle, General Miltiades ordered Pheidippides, an Athenian herald, to run the twenty-six mile trek from Marathon to Athens with news of the triumph. With message and shield in hand, Pheidippides sprinted into the Greek capital proclaiming “Victory! Victory!”. He then died of exhaustion. General Miltiades was victorious because he planned and prepared thoroughly, used superior methods and possessed and unyielding commitment to success. Nearly 2,500 years later, we at Marathon Commercial Construction, L.L.C. share this ideology. Our adoption of the name “Marathon” is a statement of our corporate ethic as well as our intent to serve our clients with the highest and best caliber of commercial construction management attainable. The image of the man in our logo is the statue of Pheidippides as seen northeast of Athens. Marathon is founded by O. Preston Smith and Michael E. Smith and officially incorporated on Independence Day July 4th, 2006. In the first full calendar year of operation, Marathon partnered with Living Hope Bible Fellowship, St. John’s Episcopal, Cross Timbers Church and others as well as the first of many projects for Fresenius Medical Care. Marathon continued to grow at a measurable pace, adding Fort Worth Christian School, Fort Worth Housing Authority, Metrocrest Presbyterian, Parkland Hospital, and F&L Industries to the list of clients successfully served. Marathon grew through this period of economic instability, building three of the largest projects to that date. New clients included Redeemer Presbyterian Church, Sacred Heart of Jesus Christ Catholic Church, and Lake Cities M.U.D. Customer service to repeat clients grew as well. Fortune 500 companies such as Colgate-Palmolive Company and Jones Lang LaSalle brought more opportunities to serve. One of the largest sanctuary projects to date for the Dallas Catholic Diocese and St. Joseph Catholic Church was completed as well. Marathon’s medical division grew substantially over this period, serving new and existing clients alike, and was the catalyst behind a statewide expansion of our service area. More Fortune 500 companies such as GameStop Corp. were added to the list of clients that we were honored to serve. Marathon’s strategic growth has resulted in a company that has a conservative management approach to providing robust project delivery capabilities. Three of the company’s largest projects were successfully completed during this period. After more than a decade of service, Marathon provides our clients with the most cost-effective and reliable general contracting option in the market today.